Baku first hosted F1 in 2016, with its street circuit running in part along the shoreline of the city’s historic center, classified as a World Heritage Site by UNESCO. It soon grabbed the attention of motor fans, and for the last two years running has been voted as the best race of the season in the annual survey by the F1 Fan Voice community. Sam Smith, who became a sensation in the British pop music by the number of sold albums, will perform after qualification round of the Formula 1 Azerbaijan Grand Prix on Saturday evening, Azertag reports. The live performance of a pop star will take place on April 27, 2019 at the Crystal Hall. Sam Smith rose to fame in October 2012 when he was featured on Disclosure's breakthrough single "Latch", which peaked at number eleven on the UK Singles Chart. His subsequent feature - on Naughty Boy's "La La La" - earned him his first number one single in May 2013. In December 2013, he was nominated for the 2014 Brit Critics' Choice Award and the BBC's Sound of 2014 poll, both of which he won. In December 2014, Smith was nominated for six Grammy Awards, and at the 57th Annual Grammy Awards in February 2015 he won four: Best New Artist, "Stay with Me" for Record of the Year and Song of the Year, and “In the Lonely Hour” for Best Pop Vocal Album. At the 2015 Brit Awards, he won the awards for British Breakthrough Act and Global Success. At the 2015 Billboard Music Awards, Smith received three Billboard Awards: Top Male Artist, Top New Artist, and Top Radio Songs Artist. His musical achievements have also led him to be mentioned twice in the Guinness World Records. For his and Jimmy Napes' song "Writing's on the Wall", the theme for the James Bond film Spectre (2015), Smith won the Golden Globe Award and the Academy Award for Best Original Song. His second studio album, The Thrill of It All, was released in November 2017, and debuted atop the UK Albums Chart and the U.S. Billboard 200. The lead single, "Too Good at Goodbyes", reached number one in the UK and Australia and number four in the US. 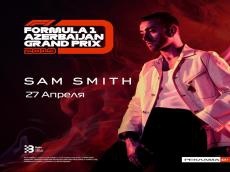 “We are very pleased to announce that Sam Smith will headline the Formula 1 Grand Prix of Azerbaijan this year’s concert program. He is an ingenious singer, and his beautiful and unique voice has already won the hearts of a multimillion audience since he first received worldwide recognition. I am sure that with his huge and devoted fan base in Azerbaijan, the singer’s post-qualification concert will be one of the most significant events of our race weekend. Taking this into account, I urge all fans of Formula 1 and Sam Smith's talent to join us for the most spectacular racing weekend and spend an unforgettable weekend in Baku. Make sure that you have purchased tickets for the dates of the Azerbaijan Grand Prix, namely, April 26-28, 2019,” BCC Executive Director Arif Rahimov said. All ticket holders for the Formula 1 Azerbaijan Grand Prix will have free access to concerts, as well as transportation to get from the track to the Crystal Hall concert arena.